Agoura Hills Truck Accident Injury Attorney - Over 40 Years of Experience You Can Trust! Were You or a Loved One Injured in a Truck Accident or Car Accident in Agoura Hills? Parking maneuver and traveling the wrong way were the lowest movement preceding collisions, each leading to 4 injuries. Over 1.2 million drivers were arrested in 2011 for driving under the influence of alcohol or narcotics. In 2011, 15% of all drivers involved in fatal crashes during the week were drunk, compared to 31% on weekends. Our Agoura Hills truck accident injury lawyers and law office offer caring and aggressive legal help for truck crash injury victims, which includes big rig or 18 wheeler truck collisions, and for the families of the victims killed in truck and other fatal accidents or wrongful death claims in Agoura Hills, a city located in Los Angeles County, California with a population of 20,330. Agoura Hills is surrounded by Oak Park to the north, Westlake Village to the west, Thousand Oaks to the northwest and Calabasas to the east. 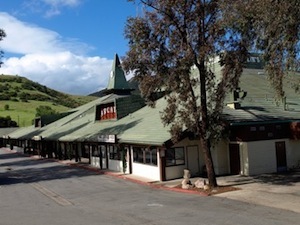 Agoura Hills is home to The Canyon Club, which hosts various concerts and events. For a fun night out you can also visit Padri Restaurant & Martini Bar on Agoura Road that offers fine dining and dancing. It is vital to keep a three car distance between you and the vehicle driving in front of you, because if the other vehicle suddenly brakes for whatever reason, you will have enough time to react by either moving out of the way or braking fast enough to slow your car down, preventing a collision with the other vehicle's rear. There is also the possibility that your vehicle has a malfunction and for some reason you cannot slow it down fast enough or you accidentally accelerate by pressing on the gas pedal. Then if you have a three car distance, you would have enough time to correct your error. Furthermore, a truck driver following this advice will avoid getting into a tragic accident, because a truck takes more time to slow down compared to most other vehicles, especially a big rig, so keeping at least a three car gap is essential to prevent serious injuries from truck accidents or any other motor vehicle accident. 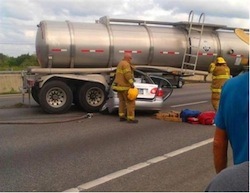 A serious and common injury that victims of truck accidents suffer is a broken shoulder or fractured humerus. A broken shoulder is a very delicate injury that requires the immobilization of the arm with a support cuff at the wrist that is attached by a sling. There is a high amount of pain during the first two weeks of a broken shoulder that requires pain medication. More serious broken shoulders require surgery to stabilize the fracture. If you or anyone you know sustained a humerus fracture from any truck accident or other personal injury accident in Agoura Hills, Los Angeles or anywhere in California, please contact us now, including for referrals to doctors who may provide treatment without requesting payment until the claim is resolved. For more information about truck accident injury claims and to find out more about our law firm, please see our Truck Injury Accident Web Site and Attorneys' Profile Pages. The Law Offices of Gary K. Walch, A Law Corp., will make it its objective to aggressively pursue your rights while best representing your interests. Our law firm achieves its goal by providing you with the strong advocacy that you need when you or a loved one has gone through a horrific truck accident or other injury accident in Agoura Hills or anywhere in California, and simultaneously offering a compassion and understanding to make this process easier for you and your family. Our lawyers handle accidents involving truck, car, train, motorcycle, bus, bicycle, uninsured motorist (UM), hit and run, pedestrian and much more.